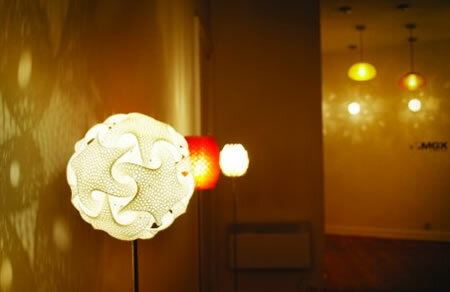 .MGX is is Materialise's fancy design label for 3D printed furniture and lamps. Their flagship store is in Brussels’ exclusive Sablon district, and it contains three-dimensional goods printed with rapid prototyping technology from CAE/CAD files from the company's designers. Ideally, you could design your own goods, upload your CAE/CAD file and they would use their rapid prototyping technology to produce it for you on the spot. Whether you are an individual, passionate by design, a professional architect or somebody who likes to try-out new technologies, i.materialise enables you to create and 3D print your own designs. By bringing high-quality 3D printing within everybody’s reach, i.materialise offers imaginative people unique possibilities to turn their creative ideas into reality. At the same time, i.materialise, dares to challenge their customers, to surpass themselves, and to surprise the people around them. Make your own interior objects: lamps, vases, ornaments, … design and 3Dprint a scale model of your new house … or even experiment with garments. With 3D printing you create your own world around you. And finally the manager comes and reads from a notebook, ladies and gentlemen, this momentous occasion, jaw, jaw, and now they are placing the first object in the unit in our Singapore branch (Boomzilla sees on TV, out on the pylon, it's a gold statue of the Lucky Dragon himself, smiling) and it will now be reproduced, at a molecular level, in every branch of our chain throughout the world. And don't you wish your iPad printed to a Zprinter 350 Full-Color 3D Printer ?